Interest is off the charts for @Tweeplechase and #Oshbash! UPDATE on 07.20.11: If you are wondering just what #TWEEPLECHASE is, we have posted a little more info on how the game is played here. UPDATE on 07.18.11: We are ELATED to have Sporty's Pilot Shop come on board to contribute a very cool #Tweeplechase prize. One lucky winner will claim a Sporty's Air-Scan VII scanner, which ought to come in handy since you are at an AIR SHOW! Be sure to show some love by visiting the Sporty's booths 4128, 4129, 4130 in Hangar D while at #OSH11. This also pushes the grand total to $2,088! That's what GA advocacy looks like. When the aviation family comes together, we all win. UPDATE on 07.17.11: Another day, another Airplanista hero emerges! Nate Carriker, a current airline pilot and author of "A Silver Ring" will be on hand to sign 10 copies of the book as #OSHBASH raffle prizes! That's a value of $149.50...thanks for supporting the GA family, Nate. 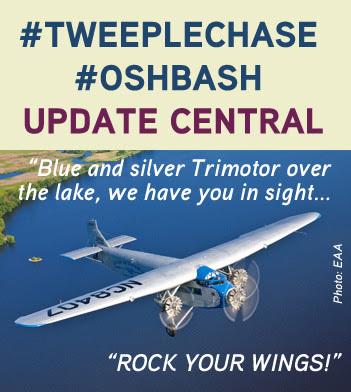 Your generosity pushes the total of #OSHBASH and #TWEEPLECHASE freebies and prizes to $1,899! You can meet Nate at several of his appearances at EAA's Author's Corner at @OSH11! UPDATE on 07.16.11: Wow, another new Airplanista hero!!! Paul at Gold Seal Flight Products is donating two $100 gift certificates and one $50 gift certificate as raffle prizes for #OSHBASH! So make sure you stop by booths 2067 & 2068 in Hangar B and say thank you for supporting the GA advocacy mission of Airplanista Magazine! And of course, make sure to come to the tweet-up and get your name in the hat to win these great prizes! UPDATE on 07.16.11: Cory, who pilots a very cool PZL Wilga, has purchased 20 posters of Amanda Franklin from Kyle Franklin and is donating them as #Tweeplechase prizes. So I will add one chase that ends at his Wilga so the first 20 peeps who solve this one gets one of these collectible posters. Thank you Cory, you're our new favorite Wilga driver! UPDATE on 07.15.11: Just added this list up, we are now at just over $1,300 in freebies being given away to our readers and followers. This is a great example of the aviation family helping each other to all pull in the same direction to help strengthen GA. When I set out to develop some sort of way to involve our readers in some fun, games and social networking at the 2011 edition of EAA’s AirVenture Oshkosh show, I had no idea what would happen. My goal was to make it an entertaining, interactive way to bring fellow Airplanistas together to enjoy the company of others who eat, sleep, breathe and live aviation 24/7/365. A celebration of GA’s most notable activists and advocates, that’s my mission. – And we’ll do a huge multi-winner chase sponsored by The PBS TV series, The Aviators. – and anything else we can dredge up between now and the tweet-up. So as you can see, it will REALLY be worth your while to attend this event and hang out with fellow airplanistas and maybe win a cool prize. So stay tuned, try to remain calm as the show gets closer by the hour, and we’ll update this post if any more big developments happen. Rock your wings if you’re as excited about Oshkosh as I am!!! !